With the holidays behind us and a mild winter upon us, looking forward to Spring is exciting! This is the perfect time to start thinking about how you want to go about updating your deck. Deciding what maintenance, additions, or improvements that you have in mind for your backyard is no small task. Today backyards have transcended beyond swing sets and wooden benches. Homeowners have really taken backyard living to the next level. Thankfully, this kind of project has been made easier with Trex decking. If you are considering re-doing your entire yard and landscape or want to become part of the craze and start your own outdoor living space Trex Decking is the way to go. From decking, to railing, to lighting, and accessories Trex has something for every aspect of outdoor living. Trex has worked hard to expand its available products to increase selection and improve performance. Deck railing has come a long way and Trex is one of leaders in the field. Trex has put forth great effort to meet the growing demand for advanced decking products. Trex Signature Railing system is an innovative aluminum railing system that is not only functional but durable. Traditional aluminum railing was plain and did not offer much in aesthetics. With sleek metal balusters and curved lines this aluminum railing is one of a kind. It blends into your landscape and does not present with harsh lines and edges. The Tres Signature railing line is one of the only aluminum systems that offers curved panels. In response to the outdoor living space trend which often include outdoor kitchens, Trex Decking has expanded its accessories to bring your dreams to life. One of the newest additions to the Trex Outdoor Kitchen collection is a line of customizable cabinets so that you can bring your electronics outside amping up your entertainment abilities. These Trex Decking cabinets also provide a great solution to hiding plumbing, propane tanks, and other kitchen necessities. This cabinetry has all of the same quality and characteristics of Trex Decking. They also come in shades that are complimentary to your Trex Decking and Railing systems. Remember that no matter what Trex Decking line you choose you can rest assured that you will receive all of the benefits Trex promises. 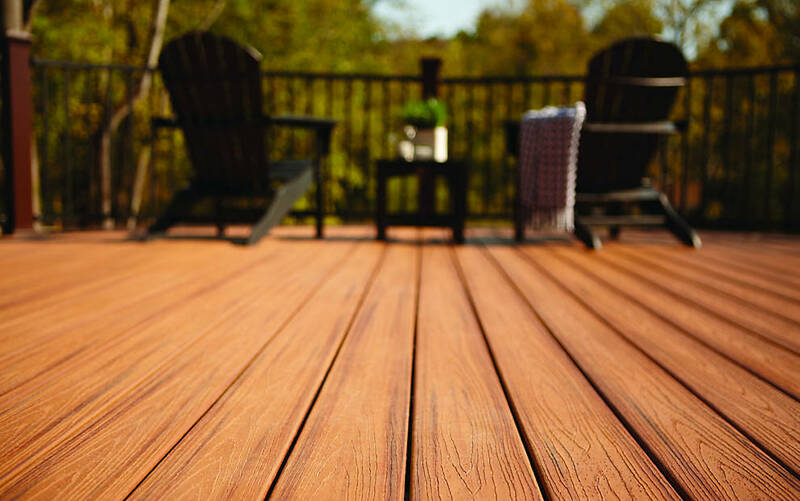 All Trex Decking is low maintenance, fade resistant, stain resistant, is made of 95% recyclable materials. Before making changes to your existing deck and yard or before you design new landscaping all together take the time to look at what Trex Decking has to offer! If you would like to talk with someone about Trex Decking and how to handle installation, get in touch with us! Our experienced staff would love to walk you through the process and answer any questions that you have!